Please enter quantity after clicking 'Add to Cart'. 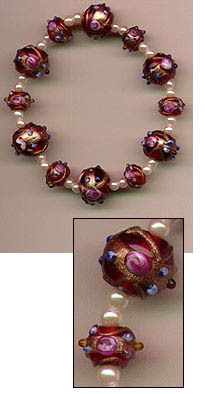 The flame of light ruby glows from within the transparent glass of these lovely wedding cake beads. Beautiful lampworked and handmade beads, crystal and firepolished beads, faux pearls and findings for jewelry - necklaces, bracelets, earrings, as well as rosaries, decorating and art - all your beautiful creations. Choose from a variety of wedding cake beads, dot beads, fine Czech lampwork in myriad interesting styles. We love jewelry makers, beading artists, crafters, artists and bead-lovers, and We Love Beads!